This is Abbey's reading log from last week. Can I just tell you how H-A-P-P-Y I am that she is reading Nancy Drew? It makes me grin from ear to ear. I loved Nancy Drew books when I was younger. LOVED them. 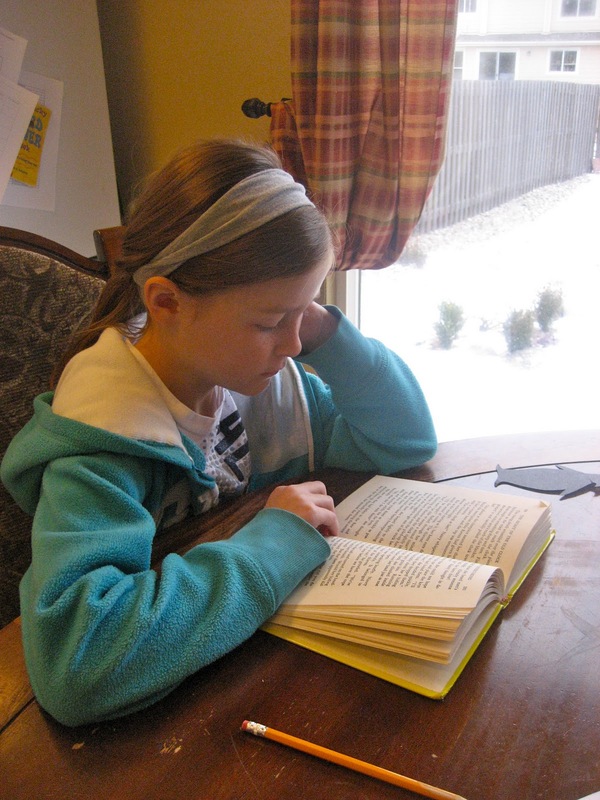 Her older sister, Sarah, the girl who has a voracious appetite for the written word and who claims her sport is Xtreme reading has never gotten into Nancy Drew. She tried. Tried again even. But it just wasn't something she wanted to pursue. I probably didn't contain my disappointment well. One morning, around the first of the year, Abbey went with me to the grocery store. We were talking about her beautiful chestnut-colored hair and I said: Hey, you know who has hair the color of yours? NANCY DREW! She loved that, so I started telling her all about the characters in Nancy Drew novels--Bess, George, Ned, Hannah. She knew a little bit from seeing the movie, but I told her the books were VERY different from the movie. She was intrigued. She told me she thought she might want to try reading the first book because she loved solving mysteries. An hour or so later she helped me find black beans at the grocery store and she pulled my ear close so she could whisper: See, I found the beans for you. I'm sort of a mystery solver. Soooooooooo adorable. The next thing I knew she came home from the school library with the first two books in the series. Last week Sarah helped her find a bunch of books that were in a chest in the basement...most of these are ones that my mom found at "Friends of the Library" sales. Abbey has big plans to read them all! She walked into the kitchen this morning and the first thing she said to me was: Mom, I had to turn my light out last night JUST when Nancy was about to find the will. She ate breakfast and got dressed in record time this morning so she could keep reading. It's pure happiness for my mama-heart! Did your girls ever get into baby-sitter club books?? That was my obession when I was their age and was an avid reader!!!! Still am a HUGE reader!! I love how the one day says 30 (somethin). Is that Abbey in the picture? Her profile looks so much like Sarah! Oh my, that's wonderful! 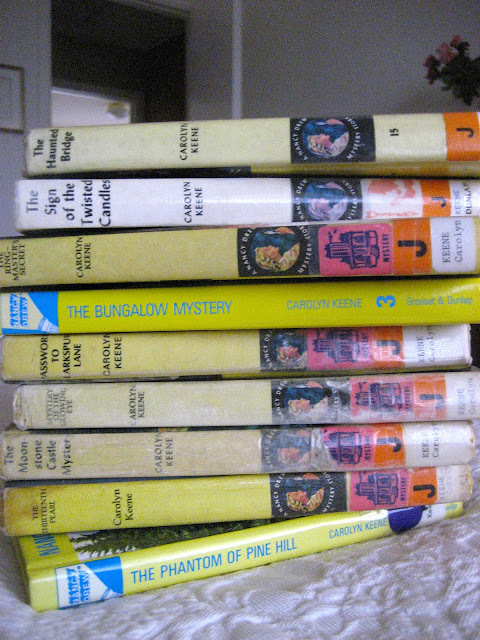 I was a huge Nancy Drew fan too, and I wish I had all my books from growing up (they're long gone, I'm afraid, gave some to nieces and the rest my mom tossed or sold in a garage sale, UGH!). My maiden name is Keene and I used to pretend I was going to be a famous writer some day too (didn't know then about pen names!). I kept a spiral notebook for a time, and would jot down parts of stories or ideas. I'm sure they were VERY simliar to what I read in whatever Nancy Drew book I was reading at the time, LOL! So glad your family loves to read, reading is a wonderful thing! Whoa. I just clicked on here and saw your new design. How did I miss that? I love it!! I love that sweet picture of Abbey, too. I forgot about Nancy Drew. I'm sure Emma would love those. My neighbor had a boxed set of the original 130-some Nancy Drew books, and so I was able to read through them all. I love Nancy Drew! So sweet! I love seeing her read at the table before school. We haven't tried Nancy Drew yet, but J is this way about all the American Girl books. I so love having a daughter who loves to read. I loved Nancy Drew! I see a few in that stack that I've read myself! Come to think of it, these would be fun to read out loud with the girls. It's been years since I read one! So glad she's reading the originals and not the newer versions. My boys really like the Magic Treehouse series. So fun!!! I hope my girls love reading like this! I was HUGE reader as a kid, so this post made me so happy....gotta love Nancy Drew! I only have boys, so no Nancy Drew for me! But my 3rd grader recently got into Hardy Boys, and we are also reading the Chronicles of Narnia together. The most important thing is that they find a love of reading. Oh my goodness! I loved Nancy Drew as a kid. What a fun thing to share with your daughter!! I can't wait until Ellie is old enough to introduce her to Nancy. Yep, Nancy Drew was the best. When I was growing up, my mom ordered a set that had 2 stories in one. Each month I'd get a book in the mail. I couldn't wait! And I love your new blog site look.